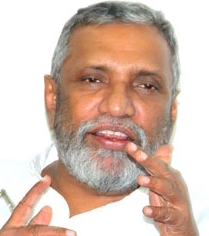 Elections Commissioner Mahinda Deshapriya says that several candidates contesting the August 17 parliamentary polls will be taken to courts for violating election laws. Deshapriya in a live discussion with a local TV station last night said that after the polls, legal action will be filed against some candidates responsible for election law violations during the pre-poll period. He specifically mentioned illegal propaganda over social media, obstructing authorities from carrying out duty and conducting illegal processions as some of the offences. Also the Commissioner noted that illegal propaganda carried out by some candidates through SMS messages have been stopped with the help of the Telecommunications Regulatory Commission of Sri Lanka. In accordance with the laws all election related campaigning should have stopped since midnight yesterday, 48 hours prior to the dawn of the polls day. However, some candidates were using both the social media and mobile phones to carry out propaganda even today, a serious breach of polls laws. The JVP General Secretary Tylvin Silva said last night that he has complained to the elections commissioner over a face book page which is displaying bogus material against the party in an attempt to mislead the voters. Meanwhile Deshapriya also said that several election monitoring organization were waiting to file complaints in courts and with the Human Rights Commission over the misuse of state property in election campaigning, after the polls. On the subject of declaration of assets by candidates, Deshapriya said that from political parties which represented the previous parliament, an overwhelming majority of candidates had declared their assets unlike previous elections. However, according to the Commissioner only a few candidates contesting from some obscure parties and independent groups have declared their assets. According to Deshapriya, the Elections Department had an extensive archive of photographic and video footage evidence that would help initiate legal action against errant politicians. However, Deshapriya said that he did not have sufficient power to initiate legal action against all elections law violators or the power to take legal action against any candidate who violates election laws even after the conclusion of elections. But he said that if any citizen, civil society organizations, media etc. wish to file action the information gathered in this manner by the department could be used. According to both election observers and analysts alike the parliamentary polls, 2015 slated to take place in a couple of days has been the most disciplined and well behaved election in Sri Lanka since 1989. Observers and analysts also have been unanimous in their praise for the Election authorities and the Police for maintaining law and order and keeping polls law violations to a minimum compared to elections in the recent past. « If MR’s Defeat Is Certain, Why Not Vote JVP!